(Vatican Radio) Pope Francis celebrated Mass in Piazza Vittorio during his Apostolic Visit to Turin on Sunday, reminding all to found their lives upon the ‘rock’ which is Christ. The Holy Father based his Sunday homily to the faithful of Turin on the Collect: “you never fail to help and govern those whom you have set upon the sure foundation of the rock of your love”, saying that three important aspects of the love of God are that it is ‘faithful’, it ‘recreates all things’, and is ‘stable and sure’. Recalling the Psalm 'His love endures forever', Pope Francis said that Jesus embodies the faithfulness of God’s love without limits or measure, since he is indeed 'the face of God’s mercy'. The love of God recreates all things and renews them. The concrete expression of this is the recognition of one’s limits and weaknesses, which is the 'door to pardon which renews us'. The sure sign of our transformation by God’s love is the ability to divest ourselves of rancor and hatred by putting on 'the vest of service and kindness to others'. 'The love of God', Pope Francis said, 'is stable and secure', as Jesus shows in the Gospel. He calms the storm of our lives by commanding the winds and sea. For the person at the point of surrender, the Lord 'comes to him and offers him the Rock of His Love'. Starts at 10.35 am - Pope Francis presides at Eucharistic Concelebration with the participation of the people of Turin, in the course of his pastoral visit, on the occasion of the bicentennial of the birth of Don Bosco. (Vatican Radio) Describing his prepared remarks as “a little formal,” Pope Francis laid aside his written text and spoke off-the-cuff for approximately thirty minutes with male and female religious of the Salesian Family. The Salesians, with their sister order the Daughters of Mary Help of Christians, were founded by St John Bosco – known as Don Bosco – Turin’s most famous and well-known saint. Pope Francis spoke about three specific aspects of the charism of Don Bosco: his trust in divine Providence; his vocation to be a priest of the young, especially the poorest among them; his loyal and active service to the Church, particularly to the Pope. (Vatican Radio) At the end of the first day of a two day trip to Turin, Pope Francis met with tens of thousands of young people in the city’s central square, Piazza Vittorio. Pope Francis spoke to the young people “from the heart” for more than half an hour, laying aside his prepared remarks (which he promised would later be published). The Pope responded to questions from three young people on the topics of love, life, and friendship. Love, the Pope said, is concrete, and is seen more in actions than in words. Love always communicates itself. Love, he continued, is very respectful of persons, it does not use people, and so it is chaste. Starts at 5.55 pm - Pope Francis meets children and youth of Turin, in the course of his pastoral visit to the city on the occasion of the bicentennial of the birth of Don Bosco. TURIN, ITALY -- Pope Francis has told young people they should always seek to go against the current of modern culture, live chaste lives, and not put their trust in worldly governments or powers. Speaking in an incredibly dense and personal off the cuff address to thousands of youth in this northern Italian city Sunday, the pontiff used colorful, blunt words to express his dissatisfaction at modern culture and at how world leaders tend to treat human beings. Addressing the question of a young woman who expressed her distrust in society after not being able to find work for years, the pope said: "In Europe there is war, in Africa there is war, in Asia there is war. But can I have trust in a world like this? Can I trust the world's managers?" "When I go to give my vote for a candidate, can I trust that they will not bring my country to war?" Francis asked. "If you put trust only in people, you lose," he said. Then, continuing to speak about people who make arms or invest in arms sales, the pope exclaimed: "They say they are Christians!" "'No no, Father, I do not make [them]," Francis imitated such a person. "'I only have my investments in the fabrication of arms.'" "Why?" the pontiff asked. "Because the interests are a bit higher. And so the double-face is money flowing today; to say one thing and do the other. Hypocrisy." Continuing on the subject of war to speak about both the Armenian genocide in the early 20th century and the Jewish holocaust, Francis said: "The great powers had photographs of the railways that brought trains to concentration camps, to Auschwitz, to kill Jews, Christians, Gypsies, homosexuals." "But tell me, why didn't they bomb them?" he asked. "The great powers, they divided Europe like a cake." Pope Francis embraces Eugenio Bernardini, a Waldensian pastor, at the community's church in Turin, July 22, 2015. Credit: L'Osservatore Romano. Turin, Italy, Jun 22, 2015 / 12:28 pm (CNA/EWTN News).- Pope Francis met on Monday with members of the Waldensian movement, an ecclesial community which suffered persecution from Catholic authorities from the 12th to 17th centuries. He apologized for the Church's “non-Christian attitudes and behavior” towards the Waldensians during that period. “Reflecting on the history of our relations, we can only grieve in the face of strife and violence committed in the name of faith, and ask the Lord to give us us the grace to recognize we are all sinners, and to know how to forgive one another,” the Pope said June 22 at a Waldensian temple in Turin. Monday's encounter marks the first meeting between a Pope and the Waldensian community. Founded in Lyon in the late twelfth century, it is currently centered in Italy's Piedmont region, which Pope Francis visited June 21-22. It was an unforgettable reunion. For Pope Francis’ cousins, for their children and grandchildren, today’s lunch in the Archbishop’s residence was a moment they will carry in their hearts for the reset of their lives, the most precious of memories. “We had a good time together, we talked about family things. He is one of us,” Elio Berello, Francis’ second cousin said as he exited the residence at around 4 this afternoon. (Vatican Radio) The challenges, the vocation and the mission of the family are the key themes or guidelines contained in the Working Document (Instrumentum Laboris) for the upcoming Synod on the Family that was released on Tuesday (June 23rd). The Instrumentum Laboris contains the full text of the Final Document (Relatio Synodi) of the previous Synod on the Family held in 2014 as well as a summary of the replies to a questionnaire that that was sent to all the Catholic Bishops’ Conferences and other Church organisations around the world. At a press conference in the Vatican, the Secretary General of the Synod of Bishops Cardinal Lorenzo Baldisseri, noted that Pope Francis had urged the participants at the conclusion of the previous Synod to reflect on the proposals and seek concrete solutions for the many difficulties and challenges facing families today. He said this working document was the fruit of that work. It contains, said the Cardinal, not just the full text of the Final Document from last year’s Synod but also around 99 replies from Church organisations as well as 359 observations sent in by both clergy and individual lay Catholics including many families. The theme for the upcoming Synod in October is “the vocation and the mission of thefamily in the Church and the contemporary world" and Cardinal Baldisseri said the working document is divided into three parts. The first is listening to the challenges facing the family, the second is discerning the family vocation and the third is the mission of the family today. He said the three parts include the addition of new topics pertaining to marriage and the family including issues such as falling birth rates, young people and their fear of getting married and the indissolubility of sacramental marriage as a gift and a duty. The second speaker at the press conference, the Hungarian Cardinal Peter Erdo noted how one of the key challenges facing the family is caused by an exaggerated emphasis on individual rights in today’s society that makes many people reluctant to take on lasting commitments. He said other socio-economic challenges facing the family include poverty, low pay and lack of political support for the family as an institution. When it comes to the issue of pastoral accompaniment, the third speaker at the news conference was Archbishop Bruno Forte, the Special Secretary of the Synod, who said it was the duty of the Christian community to help families grow and show God’s mercy towards wounded and fragile families. He said these include those who are separated, divorced, remarried, one parent families and unmarried couples living together. He also mentioned proposals on whether to introduce a penitential path for couples in these irregular situations. Another hotly debated issue in last year’s synod was a proposal for streamlining the procedures relating to marriage annulment, mentioned by both Cardinal Baldisseri and Archbishop Forte. ROME -- Renowned Italian tenor Andrea Bocelli, Colombian pop-star Juanes and the Philadelphia Orchestra will headline a concert on the eve of Pope Francis' mass on the Parkway in September, organizers announced today. The pope is expected to attend the performance on the last night of the World Meeting of the Families, which will also feature other, yet-to-be-announced high-profile acts. "I'm thrilled such incredible talent with tremendous global reach can join us on the Parkway," Mayor Nutter said at a news conference at the Pontifical North American College, a seminary near the Vatican. "Our Parkway has seen many great performers of course . . . now I love Jay-Z and Beyoncé and of course Philly's own house band the Roots but there's something quite magical about the idea, the thought, the vision, of Pope Francis being on stage in our city with Andrea Bocelli, Juanes and the Philadelphia Orchestra all at the same time." The orchestra will also take part in the papal mass and provide the liturgical music for the Archdiocese of Philadelphia's 500-member choir. The lineup for the Sept. 26 Festival of Families concert came on Day 2 of a trip to Rome by Mayor Nutter, Archbishop Charles J. Chaput and community and business leaders to finalize plans for the trip and the World Meeting of Families. 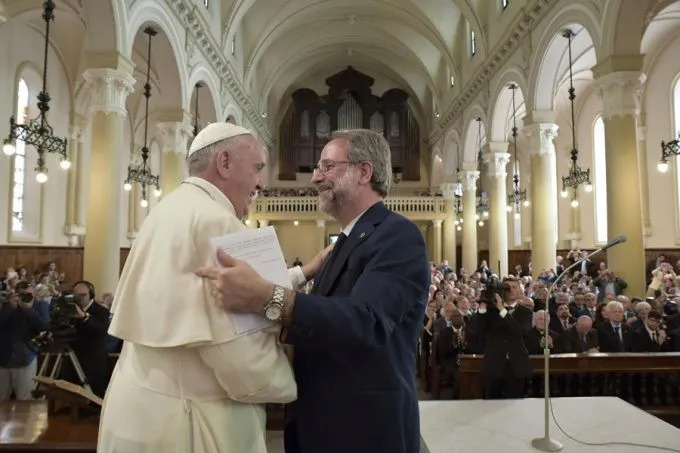 (Vatican Radio) “Our dialogue must continue” Pope Francis wrote in a Message to Olav Fykse Tveit, Secretary General of the World Council of Churches, on the occasion of their 50th anniversary between the group and the Catholic church. Cardinal Kurt Koch read the message before the group gathered at a conference held at the Centro Pro Unione in Rome on Tuesday evening. (Vatican Radio) The self-inflicted wounds of the family and the need to put aside anger and friction to protect the couple’s children were at the heart of Pope Francis’ message to thousands of pilgrims gathered for the weekly General Audience on Wednesday. Vatican City, Jun 24, 2015 / 12:00 pm (CNA/EWTN News).- That the discussion at October's Synod on the Family is going to be a lively one is indicated by the fact that the most controversial paragraphs of the final report from last year's synod are included in the working document which was released Tuesday. At a June 23 press conference presenting the instrumentum laboris, Cardinal Lorenzo Baldisseri, secretary general of the Synod of Bishops, noted that it is “based on the previous synod's document” and that his office “itself drafted many of its paragraphs” based on the responses which it received from bishops' conferences around the world to a questionnaire it had sent out. The instrumentum laboris is 147 paragraphs, and its three parts will serve as a basis for the three weeks of discussion at this autumn's gathering of bishops at the Vatican. It is available in Italian, but has not yet been released in translation. It includes in its text three paragraphs from the 2014 synod's final report which failed to reach the supermajority which is necessary for consensus. Those three paragraphs dealt with pastoral care for the divorced and remarried, and for homosexuals. They advocated admitting the divorced and remarried to Communion and reforming the nullity process, while the paragraph on care for those with a homosexual orientation was considered vague by many synod fathers. (Vatican Radio) Words, actions and the ability to listen: those are the three factors that determine the good pastor or Christian in whom the faithful recognize consistency and authority. Pope Francis reflected on this theme in his Homily at Santa Marta in the Vatican Thursday. Recalling the day’s Gospel reading in which the people marvel at Jesus’s authoritative teaching, Pope Francis said that people today know "when a priest, a bishop, a catechist, a Christian, has the consistency that gives him authority." Jesus, he said, "admonishes his disciples" to beware of "false prophets." Instead, Pope Francis asserted, those who "hear the words but fail to make them their own…do not listen seriously or fail to put them into practice will be like the one who builds his house on the sand." (Vatican Radio) “The true authority of the Church of Rome is the charity of Christ.” That was the message of Pope Francis to members of the Pontifical Eccesiastical Academy, the “Accademia” – the Roman institution responsible for preparing priests for the diplomatic service of the Holy See. (Vatican Radio) Pope Francis on Thursday said Jews and Christians can continue to cooperate together “for the good of the peoples of our time” and work for peace together – especially in the Holy Land and the Middle East. Speaking to representatives of B'nai B'rith International, a Jewish organization that sponsors cultural programs and promotes religious tolerance and international cooperation, the Pope recalled the landmark Vatican II declaration, Nostra Aetate which laid the groundwork for the Catholic Church’s relations with Jews. Founded in 1843, B’nai B’rith, which also provides humanitarian aid and community service in needy areas, has a presence in more than 50 countries across the globe. B’nai B’rith monitors and combats anti-Semitism and other human rights abuses around the world, and together with its World Center in Jerusalem, advocates on behalf of the State of Israel. Vatican City, 25 June 2015 (VIS) – The Holy Father has sent a telegram of condolences to the Patriarchal Synod of the Patriarchate of Cilicia of the Armenians, Beirut, for the sudden death of the Patriarch, His Beatitude Nerses Bedros XIX Tarmouni, at the age of 75. “I entrust to the merciful Father the soul of this devoted pastor who, as a priest dedicated himself tirelessly to the service of the communities for whom he was responsible, and later, as bishop, carried out his ministry with faith and zeal, first in Alexandria and then as Patriarch of Cilicia of the Armenians. I join in prayer with all those who are affected by his sudden passing and convey my apostolic blessing, in particular to the bishops of the Patriarchate of Cilicia of the Armenians, the family of the deceased and all those who are to attend his funeral”. 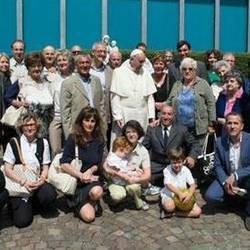 Vatican City, 25 June 2015 (VIS) – This morning in the Holy See Press Office a press conference was held to present the Eighth World Meeting of Families, to be held in Philadelphia, U.S.A., from 22 to 27 September this year, on the theme “Love is our mission. The family fully alive”. The speakers were Archbishop Vincenzo Paglia, president of the Pontifical Council for the Family; Archbishop Charles Joseph Chaput, O.F.M. Cap. of Philadelphia with his auxiliary, Bishop John J. McIntyre, and Jerry and Lucille Francesco, a couple from the same archdiocese, now married for fifty years. The archbishop of Philadelphia gave some data on the Meeting, which more than a million people are expected to attend, and from which representatives of more than a hundred nations have registered. So far 6,100 volunteers have offered assistance of various types and the event organisers intend to make more than 5,000 buses available. More than 1,600 people have signed up to the “Host a Family” programme. (Vatican Radio) The Press Office of the Holy See was the scene on Thursday for a status report on the preparations for the eighth World Meeting of Families, to be held in the US city of Philadelphia from September 22-27, 2015, culminating with the presence of Pope Francis. During the course of the conference, journalists learned that week of festivities will include ecumenical, interreligious, and multicultural celebrations of the family involving an expected 15 thousand participants from more than a dozen countries around the globe. For the Holy Father’s public engagements on September 26th and 27th, between 1 and 2 million people are expected to take part. (Vatican Radio) The Church can only become a true community if its members are willing to get their hands dirty and include the excluded. That was Pope Francis’ message during his homily at the Santa Marta Mass on Friday morning, as he reflected on the Gospel passage about Jesus healing the man with leprosy. (Vatican Radio) Pope Francis received a group of some 230 participants for the World Meeting of the International Conference of Catholic Guiding on Friday. The Guides are in Rome from June 25th-30th, to explore the theme of living the joy of the Gospel as a Guide. The international umbrella group for Catholic Girl Guides and Girl Scouts, ICCG, officially came into existence on the Feast of the Epiphany, 1965, in Rome, when twenty-one Girl Guide associations established the International Catholic Conference of Guiding, signing its Charter, its Statutes and approving its Internal Rules.